The U.S. economy grew more than previously estimated in the first quarter, up 1.1%, the Commerce Department reported. 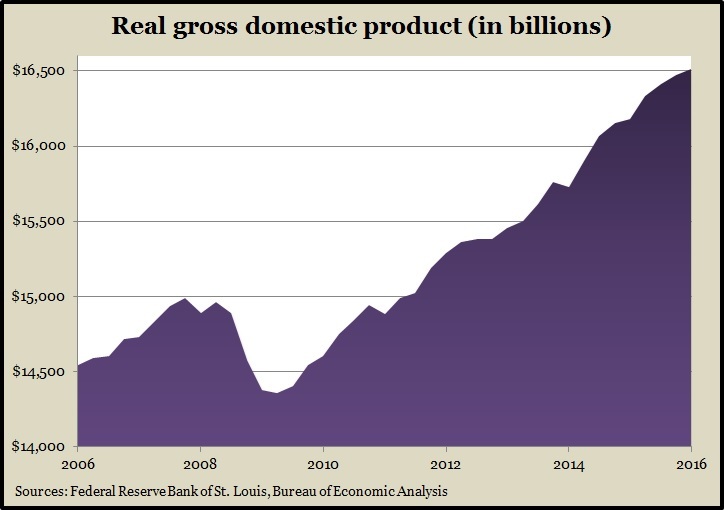 That was the best start of a year for gross domestic product since 2013, the result of stronger net exports and less weakness in commercial investment. Consumer spending, which drives about two-thirds of U.S. economic activity was at its slowest pace in two years, but the report showed housing continuing to be a key contributor to the nation’s ongoing growth. The U.S. housing recovery continued to raise selling prices in April, according to the S&P/Case-Shiller home price index. The 12-month price increase among 20 cities was 5.4%, down a tad from the March pace, more than double the general rate of inflation. A housing economist with Standard & Poor’s cited low unemployment and low mortgage rates as well as continued consumer confidence for furthering home sales. So far, seven of the 20 cities have exceeded price levels set before the Great Recession. In surveys taken ahead of the British referendum to leave the European Union, June consumer confidence exceeded analyst projections. The Conference Board, a business research group, found that consumers were even more encouraged by current economic conditions and also more optimistic about the future. Economists consider consumer confidence a harbinger of consumer spending. The Bureau of Economic Analysis said consumer spending rose again in May following a larger gain in April, the biggest of the recovery so far. Personal spending went up 0.4%, more than analysts expected and twice the rate of personal income. As a result, the personal saving rate dropped to 5.3% of disposable income from 5.4% in April. In the same report, the Federal Reserve’s favorite measure of inflation showed a 1.6% year-to-year increase for the third month in a row. The Fed’s target rate is 2%. The National Association of Realtors reported the first year-to-year decline since 2014 in its pending home sales index in May. The index suggested that the pace of existing homes will ease up, which the trade group blames on a lack of supply and affordability. Still, Realtors forecast selling 5.44 million houses this year, which would be 3.7% more than in 2015. The moving four-week average for initial unemployment claims was unchanged after four weeks of declines. Jobless claims remain near historic lows, having reached a 42-year record in April, according to data from the Labor Department. For more than three years, applications have been below the all-time average, indicating that employers are being careful about letting workers go, which helps support a stronger hiring market. Manufacturing expanded more than analysts expected in June, at the fastest pace in more than a year and for the fourth consecutive month, according to the Institute for Supply Management. Nearly all of the ISM index components showed accelerating momentum for U.S. manufacturing. Slowed lately by global economic challenges, manufacturing appears to have revived with the recent weakening of the U.S. dollar, which helps exports. Fallout from the Brexit vote could test that trend. The Commerce Department said construction spending dipped in May, although it remains at levels before the 2008 financial collapse. Residential spending, which makes up 40% of all construction expenditures, was flat from April but up 5.3% from May 2015.